geniusjaggu's analysis: Finally ASI struck wealth! A Senior Politician quit politics as he felt that he made too much money, sources close to him say as he believed that Rs.32 per day is enough to survive.. This guilt of being 'filthy rich' led him to depression - a condition psychiatrists term schizoaffective psychosis or chaotic thought process. His condition has thrown light on an issue that a handful of the people in india is grappling with. The politician, who had his name in every busted scams, had accumulated Rs 40,000 Crores in a Grameen Nirudyog Seva Bank, even though former colleagues and political experts say an individual with his wealth should ideally PM, FM or HM or a President. However, the man would out of sheer guilt, now wants to return the accumulated wealth..
Dr Tumko Kyakarni, a senior consultant in neuropsychiatry, who is treating the man, said stress triggers this condition in certain individuals. "It is because of a dispute between unlimited capabilities and limited ambitions. It could be also because of certain biochemical changes that occur in the brain. Their discipline puts them in such a state of mind that even if they make a small mistake, they think they have committed an unpardonable sin and have to punish themselves for the consequences. They tend to develop an inferiority complex," said Dr Tumko Kyakarni. The man is currently being counseled by his colleagues and also receiving cognitive behavior therapy where he is made to see his merits and accumulated talent. "We have already put him under observation, so he must not solve all Current account Deficit, Fiscal deficit, and all debt problems so soon! " said Dr Tumko Kyakarni. Meanwhile, ASI, GSI, have started excavating the ground near the said politician's residence, to find out more unaccounted wealth, "when a baba can dream 4000 tons of gold in bed of sand and rocks, and a politician can sleep on bed of cash, whats wrong in digging here when the person has already that much wealth in his house" said a officer under anonymity of darkness of pit. 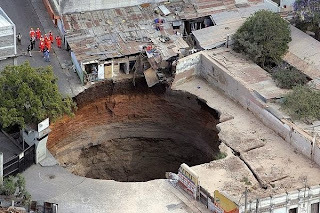 To confirm the work undertaken by ASI and GSI , here is the arial picture from jaggu's spy plane camera.